This vegan Cashew Nog recipe is super easy to make and doesn’t actually contain eggs. 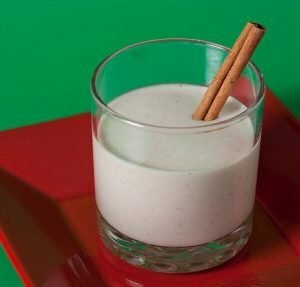 It’s just a great ‘nog to put a splash of bourbon or rum into. It’s even good on its own. Using the arrowroot powder or tapioca flour is important to achieve the creamy texture and emulsify the healthy cashew oil with the rest of the liquids. Perfect to make your Christmas evenings festive and merry. In a medium saucepan, add the water, cashews, sugar and arrowroot powder or tapioca flour. Bring the mixture to a boil and simmer covered for 15 minutes, stirring occasionally. Transfer the mixture to a blender and add the canola oil, apple cider vinegar, nutmeg, cinnamon and vanilla extract. Place a towel on top of the blender and hold it down so you’re shielded from any hot liquid that may splash up when you start the blender. Blend on the whip setting for 1½ minutes. Transfer the egg nog to a covered container and let it cool in the refrigerator for about 2 hours. It will keep in the refrigerator for up to one week. Oops, we almost forgot. If you would like, you can add a splash of bourbon or rum for a Merry Christmas treat. Thank you to Mattie from ‘Vegan Baking’.